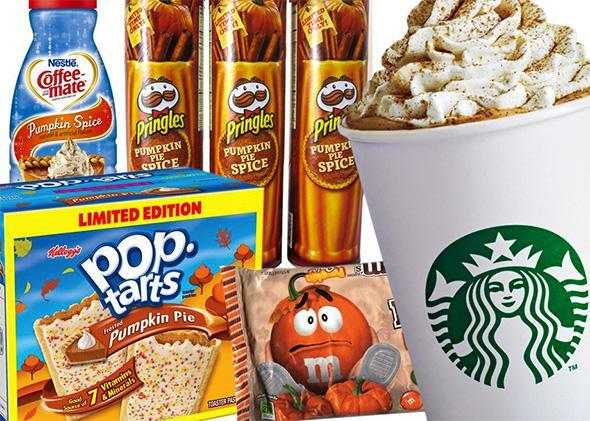 Pumpkin spice challenge: Why commercial products are inferior to pumpkin pie spice. Photo illustration by Lisa Larson-Walker. Product photos via manufacturers. One afternoon last month, I entered a liquor shop near Slate’s New York office and did something I never imagined I would do. I looked through the Italian reds, sherry, and port, until, on a dark and dusty bottom shelf, I found it: Hiram Walker-brand pumpkin spice liqueur. It cast a glow the color of urine after a harvest beet feast. Gaze downcast, I paid for it and walked stiffly back to the office, where I mixed the unhealthily ruddy liqueur with cheap white wine and a “tropical juice blend” to make something called pumpkin sangria, which tasted the way a compost heap fed with pumpkins, mangos, cough syrup, and cinnamon would smell, and which my colleagues, wisely, gave a wide berth on their way toward the case of pumpkin ale. The intermittent headache, facial twitch, and mild clairvoyance I’ve suffered since Pumpkin Sangria Day are, to an extent, your fault—especially if you’ve purchased a Pumpkin Spice Latte in the past 10 years. Thanks in large part to Starbucks’ success with the PSL—at this point as much a seasonal state of being as a sugary beverage—our culture is now thoroughly dusted with pumpkin spice from early September to the advent of gingerbread season. If you wanted to subsist entirely on commercial pumpkin spice creations for a day, you could have pumpkin spice Pop-Tarts with a cup of pumpkin spice coffee diluted with pumpkin spice Coffee-mate for breakfast; pumpkin spice peanut butter spread on pumpkin spice English muffins for lunch; pumpkin spice Pringles, pumpkin spice beef jerky, or pumpkin spice almonds for a snack; pumpkin spice fettuccini for dinner; and pumpkin spice pudding for dessert. Heck, you could even do this for a week—which is exactly what my editors asked me to do. I agreed to the challenge—on the condition that I could supplement commercial goods (such as the liqueur) with home-cooked dishes seasoned with pumpkin pie spice. (I wasn’t sure my blood sugar would ever recover if I limited myself to lattes and junk food.) I also managed to avoid pumpkin spice-scented soaps and lotions with the excuse that my partner is very allergic to such things—but know that, in line with the general trend of holiday synesthetic convergence, they are available by the gallon. Why put myself through this fragrant affair? Everyone likes a slice of pumpkin pie, but our relationship with the flavor has wafted far beyond a holiday indulgence. We’re clearly fascinated by the stuff, by the feeling that pumpkin spice represents, and yet, given that its uses seem almost entirely limited to sweet treats and novelty foodstuffs designed more for HuffPo slideshows than human consumption, I worry that we’ve misunderstood pumpkin spice to the point of abuse. In taking the amount of pumpkin spice in my diet well beyond the recommended levels, I hoped to find a useful rule of thumb within the overhyped haze, a pinch of culinary truth amid the pounds of the spice spilled this time of year. In an irony that seems to symbolize the state of commercial food production, products labeled “pumpkin spice” almost never contain any pumpkin. That’s because pumpkin, alone, is gross. Only in, for example, a pie with sugar and spices does it become palatable, and yet, for a host of complex historical reasons, the gourd remains the flavor’s primary symbol instead of, say, the more-accurate-by-weight cinnamon stick. Cinnamon is the main ingredient in the mixture of ground spices commonly sold with the label “pumpkin pie spice,” which also contains ginger, nutmeg, and sometimes cloves and/or allspice. Commercial “pumpkin spice” may contain those spices, but they may also contain synthetic compounds that merely trick our tongues in the service of manufactured seasonal excitement. Doesn’t sound so cozy, does it? Having eaten as many “special edition” foodstuffs as possible during Pumpkin Spice Week—even the highly anticipated Pumpkin Spice M&M’s—I can say that it is not cozy at all. After a few breakfasts of pumpkin spice English muffins and splashes of pumpkin spice Coffee-mate (which, to be fair, is gross regardless of flavoring), I was definitely left cold on the commercial front. But, in a happy surprise, I came to regard those products as a sad category separate from the real-deal spice blend, of which my sojourn helped to foster a much-enhanced appreciation. My main takeaway: We should be using pumpkin pie spice far more often in savory foods than we use it in sweet ones. I understand that this goes against conventional cooking practice; cinnamon, nutmeg, and ginger have traditionally been reserved for baked goods—pies, spice breads, cakes, and cookies as well as waffles and pancakes. Perhaps you’ve had spiced-pumpkin-stuffed ravioli, but that’s about as far toward the savory as most people will have toted the shaker. But in my week of experimentation, I went further. I started with a somewhat safe choice: a Spanish pumpkin soup gussied up with the spice mix and pimentón. Served with blue cheese-smeared toast and a further sprinkle of spice, you’ve got dinner. I then improvised a pumpkin pie spice curry with pulled pork and sweet potatoes—again, solid. Further tests included Sunny Anderson’s pumpkin pie spice-rubbed pork loin (genius), a ham and Swiss melt with p-spice mayo (not half bad), and pumpkin pie spice couscous with shredded chicken (a new staple). But the most delightful preparation I discovered—on the advice of an inventive friend—was, believe it or not, fish tacos. The fish themselves were simply cooked with salt and pepper, but included in the taco alongside the jícama and cilantro salsa were finely diced pieces of acorn squash roasted with, of course, pumpkin pie spice. I do not normally associate tacos with sensory surprise, but this night, I was impressed. In fact, the whole experience left me a bit awestruck at the adaptability of pumpkin pie spice. Some dishes underlined its nutty fragrance while others benefited from its warmth. On the roasted pork loin, it took on notes of cumin and coriander, while on the sandwich it was almost peppery. Everywhere I used it—even a sprinkle in salad dressing—it blended with savory flavors to add a certain heft and sophistication while never making me think a PSL had spilled into my bowl. Speaking of the iconic Starbucks creation, I’m beginning to wonder if the latte’s success has created a kind of flavor paradox; it seems to have been almost entirely responsible for making pumpkin spice so fashionable while, due to overexposure, simultaneously making it a joke. When concoctions like the pumpkin sangria are semiserious propositions, a decadence alert should go off. Indeed, it may be that we’ve reached “peak pumpkin spice” in 2013: The commercial monolith may be on the verge of crumbling to a heady dust. And who will miss it? The overabundance of pumpkin spice marketing in the public sphere has undoubtedly discouraged people from cooking with the real thing in their homes, which is exactly what you should be doing. Do yourself a favor this Thanksgiving—skip the pumpkin spice liqueur (please, please skip it) and make or purchase yourself a healthy container of pumpkin pie spice. Use it in your pies and other holiday fare, of course, but don’t then let it drift to the back of the cabinet, left to go stale by spring. Instead, store it in a handy place, one where you will be reminded—even tempted—to use it regularly. Unlike the brilliant foliage, pumpkin spice is one staple of autumn that need not fade with the season.